In 2010, the Conservative-Liberal coalition government invited the Office for National Statistics (ONS) to develop new measures of national wellbeing. British Prime Minister David Cameron was quoted as saying that a wellbeing index could “lead to government policy that is more focused, not just on the bottom line, but on all those things that make life worthwhile” (BBC, 2010). The first results of the £8 million, 4 year National Wellbeing Project (NWP) are expected in July 2012. There are key links between academy and government within a wellbeing agenda that cuts across the political spectrum and that is emerging within the context of widespread economic austerity. The wellbeing agenda is significant to our understanding of what counts as knowledge, how truth is produced and institutionalised, how we constitute our subjectivities and how the power-knowledge complex functions within society. Within existing literature focus has centred on problems measuring subjective wellbeing (Cromby 2010, Wilkinson 2007) and the ideology and rhetoric of happiness research (Yen 2010, Christopher & Hickinbottom 2008). Sointu (2005) analysed how conceptualisations of wellbeing reproduce important social norms and reflect shifts in our experience of individual agency and responsibility. Within cultural studies, Ahmed (2010) draws on the intellectual history of happiness to question how the imperative to be happy is used to justify social oppression from feminist, queer and race theory standpoints. • Overall, how satisfied are you with your life nowadays? • Overall, how happy did you feel yesterday? • Overall, how anxious did you feel yesterday? • Overall, to what extent do you feel the things you do in your life are worthwhile? The ONS Measuring National Wellbeing Advisory Forum includes a number of champions for wellbeing science (aka positive psychology), which is informing the debates within this project. Often cited in the literature, is the Wellbeing Programme Director at the London School of Economics Centre for Economic Performance, Lord Richard Layard, who has called for the social sciences to answer the question “what is progress, and how should we measure the wellbeing of a population?” (Layard, 2010b: 534). Layard advised the 1997-2010 Labour government on matters related to wellbeing and his input remains central under the current administration. Layard’s book Happiness (2005) lays out many ideas from a wellbeing science movement that has burgeoned since 1998. The transcription from Layard’s wellbeing conference speech at Her Majesty’s Treasury from November 2010, the day of Cameron’s aforementioned announcement, provides the second paper in this analysis. In 2011, The New Economics Foundation (nef), describing itself as “an independent think-and-do tank that inspires and demonstrates real economic wellbeing,” published a document entitled The Practical Politics of Wellbeing that sought cross-party (Labour, Liberal Democrat and Conservative) and thinktank contributions to the debate. The focus of this paper will be on two of those contributions, the first written by Jonty Olliff-Cooper, a former Conservative adviser and head of the progressive conservatism project at the thinktank Demos, and the second is provided by Matthew Taylor, the Chief Executive of the Royal Society for the Arts (RSA), a body which positions itself as seeking “ideas and actions for a 21st century enlightenment.” Prior to his appointment in November 2006, Taylor was Chief Adviser on Political Strategy to the Prime Minister, Tony Blair. In his contribution, he sets out a view both of what is necessary for wellbeing to be an effective driver of policy and what its potential might be. 1. Discursive constructions – how is wellbeing implicitly and explicitly constructed within the texts? 2. Discourses – how can the discursive constructions of wellbeing be located within social and political discourses? 3. Action orientation – what is gained from constructing wellbeing in this way? 4. Positionings – what are the subject positions offered by the discursive constructions of wellbeing in the literature? 5. Practice – how do these discursive constructions and the subject positions contained within them open up or close down opportunities for action? 6. Subjectivity – what is the relationship between the discourses of wellbeing and the subjectivities created? Foulcauldian discourse analysis questions the role of language in the constitution of social and political life. From the Foucauldian view, discourses may “facilitate or constrain what can be said, by whom, where and when” (Willig, 2008: 112). This paper will be focusing upon the relationship between the wellbeing discourses and the related institutions, looking at how dominant discourses privilege those versions of social reality that legitimate existing power relations and social structures and how these ‘commonsense’ versions of reality may be challenged and resisted by counter discourses. Wellbeing is constructed within the texts as “the legitimate business of government” (Layard, 2010: line 5, p1) and the “proper objective of government policy” (Layard, 2010: line 2, p1). Within his conclusions, Layard also declares that “wellbeing can be measured” (Layard, 2010: line 16, p5). The ONS recognises that conceptualising wellbeing is an awkward task as “there is no clear definition of wellbeing” (ONS, 2011: line 1, p8), while also stating that “’wellbeing’ is often taken to mean ‘happiness’” (ONS, 2011: line 17, p2). Wellbeing is also expressed as providing an “emphasis on the whole person’s flourishing” (Olliff-Cooper, nef, 2011: line 20, p26), and a “route to a more productive and cohesive society” (Taylor, nef, 2011: line 22, p28). Wellbeing is “the essential lubricant” (Taylor, nef, 2011: line 27: p28) that permits “the ‘hidden wealth’ of our nation to be exchanged” explains Taylor, echoing the belief that “high levels of wellbeing are…. an end in themselves” (Taylor, nef, 2011: line 21: p28). ‘The thwarted self’ discourse – In describing the essential nature of wellbeing, Taylor takes the position that “wholeness…. will only ever be realised if we are truly able to know ourselves better” (Taylor, nef, 2011: line 5, p32). Echoing this, Olliff-Cooper’s emphasis on flourishing illustrates that there are assumptions here about the self that arguably have a rather ‘westernised’ slant. Nowhere is this better depicted than in Layard’s insistence that “the focus has to be on mastering ourselves and our human relationships” (Layard, 2010: line 23, p4). Foucauldian analysis is unrelenting in its admonishment of the idea that within human beings there is a thwarted, undiscovered essence that upon unveiling will enable autonomy. All that we have, states Foucault, is the task of producing ourselves. In describing the task of liberating man in his own being, he states that the moment in which one believes they have discovered a truth about themselves is simultaneously the very moment power has been exercised over them. In the process of constituting oneself, as a subject, as an individual seeking wellbeing, the production of this knowledge makes one an object of discourse. The ‘business of government’ discourse – Framing wellbeing as the business of government is indicated throughout the data, both as the duty of government and also ironically in couching it in terms reminiscent of economic language (e.g. ‘maximising’ or revealing the ‘hidden wealth’ of wellbeing) despite the clarion call sounding across the data to move beyond the economic in how we measure wellbeing. Many of the quotes in the ONS report reflect a general philosophy that there is more to life than money and possessions, that “the national wellbeing debate emphasised that ‘fairness’ and ‘equality’ are important to people” (ONS, 2011: line 4, p19). Similarly, in the nef report, Olliff-Cooper asserts that “it is wrong to think that money can buy happiness” (Olliff-Cooper, nef, 2011: line 14, p24) and makes the claim that “conservatives are interested in how the individual’s wellbeing can be maximised” (Olliff-Cooper, nef, 2011: line 29, p22), and that this “is squarely” within the Conservative tradition (Olliff-Cooper, nef, 2011: line 9, p23). The discursive constructions of wellbeing can be located within the social and political discourses of Britain and much of the western world over recent decades, a period that has seen income inequality rise sharply without simultaneous falls in happiness levels. It is worth noting on this point that although the Easterlin Paradox (Easterlin, 1974) is frequently stated, there have also reportedly been large rises in depression over recent decades that haven’t been reflective of a downturn in measured happiness. Layard reveals a utilitarian approach to happiness in his referencing of a poll in which 80% of respondents agreed with the statement that “a government’s prime objective should be achieving the greatest happiness of the people, not the greatest wealth” (Layard, 2010: line 16, p1). Aside from the questionable means of gathering data in this way on account of its ‘leading’ slant, the ideological and political implications contain certain assumptions that appear unquestioned. Within the texts, wellbeing is portrayed as the business of government, with the exception of Taylor who qualifies his support for the agenda with the caveat that beyond a certain point “the good life depends on our own interpretation of it, something that no level of state intervention could ever hope to fully deliver” (Taylor, nef, 2011: line 9: p31). The ONS Report counterbalanced public responses with feedback from its aforementioned advisory committee, the majority of whom are social scientists, economists, statisticians and bureaucrats. The lack of breadth of professions within the advisory committee limits the possibilities for cross-disciplinary critique and the confidence this bestows on social science in critically answering the questions of wellbeing could be illustratrative of an over-confidence in statistics and economics, and the capacity for these disciplines to accurately and dispassionately quantify the objective quality and value of our lives. This is an optimism that comes amidst a recession in part caused by an excessive faith in the accuracy and objectivity of the same sections of the social science community. The subtitle of the ONS report, ‘measuring what matters’ sets the tone. It is also notable that within the text of the 27 page report, there are large unattributed quotes on every page. Taken from online public contributions, they offer a particular slant to the report. Constructing wellbeing in this way is serving to prioritise particular agendas. One anonymous quote says: “I think wellbeing is related to having a fair distribution of wealth, greater social mobility and being able to slow the pace of life” (ONS, 2011: bottom line, in bold, p1). It is important to ask why this quote was chosen out of all the possible quotes and why it was given a conspicuous place within the report. Whose interests does this serve? There is a level of subjectivity in the report that suggest it may be failing to mirror the opinions of the UK public but is instead mediating them into a particular narrative. The filtering of responses in this way diminishes the objectivity that a document informing government policy would require. In delivering objective findings of Gross Domestic Product this would be difficult enough to justify, in delivering the subjective findings of the values the public sphere deems important this is even more difficult to warrant. Mention is made of the fact that David Cameron restated the importance of wellbeing to the Coalition government in his speech on the Big Society in May 2011 (ONS, 2011: line 1, p12) and although this political concept has quietened in clamour more recently, it may be that it fits within the tenets of the National Wellbeing Project, as Taylor makes clear when he states that “for initiatives like the Big Society, (happier people) are…. more likely to contribute to their community” (Taylor, nef: line 23, p28). This theme of individualism remains strongly wedded to the discourses even when the conversation is predominantly about societal issues. In drawing a distinction between ‘technical’ and ‘human’ problems, Olliff-Cooper believes that “as a society we have been inadequate at dealing with ‘human’ problems.” At the same time, from his view “far more variation in wellbeing is driven by variation in personal rather than societal factors: temperament and physical fitness for example.” (Olliff-Cooper, nef: line 16, p24). Olliff-Cooper contends that “human problems are about behaviour and motivation” (Olliff-Cooper, nef: line 23, p23) and in our adeptness at solving technical problems in the past two centuries, we have been neglectful of problems such as “reducing depression, obesity, drinking, family breakdown, loneliness and promoting a love of learning, strong communities, happiness, compassion, responsibility” (Olliff-Cooper, nef, 2011: line 34, p23). Enter the National Wellbeing Project to address these issues. The statement “personal factors are linked to the kind of actions that the research shows tend to increase wellbeing” (Olliff-Cooper, nef, 2011: line 18, p24) fits in with individualist agendas, with Olliff-Cooper believing that “personal factors are more important” (Olliff-Cooper, nef, 2011: line 30, p24). Taylor’s assertion that “without action at the individual level, where small changes in lifestyle can indeed increase people’s happiness whatever their socio-economic circumstances, little will ever be achieved” (Taylor, nef, 2011: line 32, p31) is compatible with this line of reasoning. Even in recognising the importance of the distinction to be made in understanding wellbeing at both individual and structural levels, within the commentary of his conclusion Taylor is clearly closing off the possibility of focusing predominantly on structural issues because “the success of policy interventions involves…. affecting the values and behaviour of clients and citizens” (Taylor, nef, 2011: line 24, p30). The counter-argument to this would be that affecting wellbeing at the individual level diminishes the possibilities for re-organising society according to the structural fault-lines that exist and encourages a focus on the self that distracts from societal issues. Throughout the texts the assertion of wellbeing as measurable precludes the possibility that there could be fundamental issues with the creation of such an index. Taylor’s suggestion that “information garnered through these measurements could lead to a more self-aware and empowered citizenry” (Taylor, nef, 2011: line 14, p31) belies the concern that self-reported happiness and life satisfaction surveys serve as unreliable barometers of a person’s wellbeing. Often failing to reflect the situatedness of knowledge and relations of power that imbue such measurement, the decontextualised reliance on self-evaluation means that the data cannot contain enough rigour to become a policy driver. This lack of contextuality in the measures proposed contrasts starkly with Olliff-Cooper’s claim of the capacity for conservativism to be able to “place their supreme emphasis on one central idea: context” (Olliff-Cooper, nef, 2011: line 13, p22, italics in original). Olliff-Copper seeks to reconcile the conception of conservatism as rooted in neo-liberal ideology with that of wellbeing as a concern of the left by uniting what he sees as the two strands of conservatism, the ‘free market brand’ and the ‘communitarian’ (Olliff-Cooper, nef, 2011: line 17, p21) by their shared emphasis upon context. Issues of context are actually a central concern for the agenda. Many of the subject positions within the discursive constructions of wellbeing in the literature relate to the concepts of ‘flourishing’ or ‘wholeness.’ The idea of bettering oneself looms large in such ‘thwarted self’ discourses, as in the claim that there needs to be an “emphasis on the whole person’s flourishing” (Olliff-Cooper, nef, 2011: line 20, p26) or Layard’s belief that “the focus has to be more on mastering ourselves and our human relationships” (Layard, 2010: line 23, p4). There is an emphasis on ‘becoming’ within discourses encouraging us to become ‘better,’ to reach the goals as revealed by the science of wellbeing and possibly now awaiting affirmation within government policy. Yet within the debates there is a general conceptual fog with regard to the object intended for measurement. This is amply illustrated in a current debate between one of the ‘father’s of the Positive Psychology movement Martin Seligman, who now uses the term ‘flourishing’ in place of ‘happiness,’ and Richard Layard who remains wedded to the latter as the term for measurement. Conceptual disagreements have previously centred on the use of ‘wellbeing’ as opposed to ‘happiness’ and, more recently, Andy Burnham, the shadow health secretary, has called for ‘resilience’ to be the ultimate objective for the government because measuring ‘happiness’ may promote middle-class materialistic aspirations. All of this serves to indicate that ultimately we are debating values. Reconciliation of the object for measurement is liable to prove elusive given that how each of us defines what we value is contestable. Consequently, it is asking alot of people to work towards conceptualising something for which there is so much disagreement. These slippery conceptual difficulties may help to account for Taylor’s estimation that “we are at odds with one another about how to achieve (this kind of) wholeness” (Taylor, nef, 2011: line 14, p27) and that without discovering it we will miss out on “the ‘hidden wealth’ of our nation” (Taylor, nef, 2011: line 28, p28). The terminology of ‘hidden wealth’ could be reflective of an almost ‘monetising’ of wellbeing, sitting within the ‘business of government’ discourse, and simultaneously reflective of the discourse of the ‘thwarted self’ that Foucault took aim at so often. In Taylor’s recommendation there ought to be a “continually evolving conversation with the public about what to measure and how to use the data collected” (Taylor, nef, 2011: line 21, p29) in achieving the wholeness he comments upon. This reasoning eludes the possibility that we are already so steeped in the discourses of wellbeing that have become our cultural commonsense that we cannot see outside of their constructednessany longer. This is where resistance and counter-discourse become important in the dialogue. From the perspectives analysed there is more than a semblance of intertextuality in the discourses that suffuses the data, particularly the idea of the ‘thwarted self.’ There is an individualistic responsibilisation hue to the language of the wellbeing agenda, indeed of our culture more generally. Therapeutic/self-help language descriptions of ‘flourishing’ and ‘wholeness’ are common and there is an underlying assumption of a self that is simultaneously thwarted yet sufficiently coherent and unified so as to be measured. Layard, whose policy recommendations have included the Depression Report (2006) and the Improving Access to Psychological Therapies (2006) report which paved the way for the training of health practitioners in Cognitive Behavioural Therapy, believes that in his “ideal world the government would choose its policies so as to maximise the happiness of the population” (Layard, 2010: line 3, p2). Culturally, it is a common assumption that in examining subjective experiences, we can discover the essence of our very being. Now, this may become the domain of politics. A significant problem with this is that much of the power behind the science of wellbeing and its cognitive authorities is in their presentation of themselves as grounded in a benign neutrality of disinterested evidence. The danger is that this ‘evidence’ affirms the present commonsense currencies of happiness discourse whilst simultaneously closing down other possible versions. The intertextuality across the sources chosen here is revealed in references that are reproduced across the data. There are similarities between the texts that emphasise the discursive formations and epistemes that cut across our social and political spheres. Within the supposedly more benign and neutral bodies such as thinktanks and dispassionate scientific institutions this is especially dangerous. Evidence gathered from separate, easily-trusted sources only adds depth to the power of the current discourses of wellbeing and illustrates the importance of articulating resistance and counter-discourses that alert us to closed-off possibilities. Yet within the chosen texts there is noticeably little attention paid to such counter-discourses. This may be partly down to any critique of wellness finding itself in a strange position. After all, who can resist the call to happiness, in all its commonsense irrefutability and desirability? Who can resist the ‘goodness’ inherent in its goals? Rorty (1993: 141), calls this a ‘conversation-stopper,’ as it can easily appear to be an unquestioned good for government to maximise our happiness, and this view can only gather in pace and persuasion with the contemporary development of a ‘science’ of wellbeing that further removes the object in question from questioning. The ineluctability and tautology of happiness-as-a-goal leaves us in thrall to the obviousness of its charms as a personal and political goal. In the production of truth claims as to the desirability of happiness as a goal, it is possible to create a set of practices, apparatuses and norms that are taken to be authoritative and ‘true’ and which thereby exercise personal, political and moral authority knowledge that can actually be understood as a thing of this world, not the thing of this world, inhabit and infuse the social body. We are obliged to be better because autonomy lives there. Guarding against the possibility of the National Wellbeing Project engaging in politicised dissemination of science-supported knowledge without challenge is vital. Taking up the subject positions created by the discourses of wellbeing inevitably has consequences for our subjective experience. In spite of the contingency and contestability of happiness, it is currently regarded as a viable topic for psychologists, economists and statisticians to study and measure, understood as a thing that exists inside people’s heads and that can be precisely clarified by social science. Yet it can be argued that it is the science itself, at least to an extent, that is producing the forms of wellbeing it now seeks to measure, as opposed to the supposed presence or absence of it inside people’s heads. We are being made into subjects possessing (or not) particular qualities, exemplified in Layard’s call for a focus upon “mastering ourselves” (Layard, 2010: line 23, p4). Such assertions are red rags to the bull of Foucauldian thought. The relationship between the discourses of wellbeing and the subjectivities created is one of the story of the self. The concept of a ‘thwarted self’ works on the principle that it is possible to liberate ourselves by unveiling repressed truths. Foucauldian thinking rejects the idea that there are deep truths within us, a ‘wholeness’ residing inside us waiting to ‘flourish.’ This is despite the fact that this idea has been the starting point for an enormous amount of psychological research, contemporarily evidenced amongst wellbeing scientists and memebers of the Advisory Panel of the project. The language of the wellbeing agenda and the evidence of the wellbeing sciences informing it, has implications for the way we relate to ourselves and each other, forming what Foucault calls a ‘technology of the self’ referring to truth games or ways of knowing that allow people to construct “their own bodies and souls, thoughts, conduct, and way of being, so as to transform themselves in order to attain a certain state of happiness, purity, wisdom, or perfection, or immortality” (Foucault 1988: 18). It is a complex task to dispassionately understand ourselves and how we are understood by those who administer us, in assessing which norms and values we are we living by, to see our lives from outside of the discourses within which we live. There are inevitably presuppositions built into our structural practices, the culmination of a series of historical shifts and diversions. Beyond the utilisation of Foucauldian Discourse Analysis, there are other means beyond analysing the discourses that can resist current ‘commonsense.’ It is in attempting to discern the genealogy of wellbeing discourses and of the subjectivities they construct that we may be able to illuminate the aspects of this narrative that we want to keep and those which we may choose to resist. This Foucauldian tactic, to historicise universal categories, to discover the specific scientific disciplines and particular social practices, problematises attempts to create visions of humanistic societies such as that of a ‘flourished’ or ‘whole’ population living in perfect wellbeing. 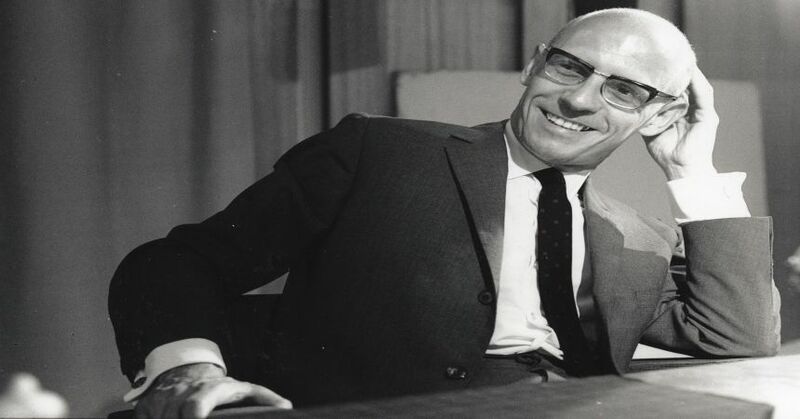 To Foucault, one of the hallmarks of Western political philosophy has been its devotion to such abstractions, but Foucault claims, it is precisely this emphasis, this ‘will to knowledge’ that has left us in the dark about the functioning of power in Western societies. His genealogical method diverts us from dreams of perfecting the wellbeing of a population, to ask instead how power operates within and through our society. In describing the working institutions, academy, government or thinktank, that appear to be neutral and independent, there is the possibility of unmasking the political violence that obscurely exercises itself through them. It is not possible to deliver a fixed, rational standard of that which constitutes a happier society. Wellbeing is a concept that is being employed in our society as an instrument of a certain political and economic power. The ‘will to knowledge’ towards understanding happiness in our culture is simultaneously part of the danger and a means with which to resist that danger. The intellectual and political work is to focus on the relationship between the social sciences and social practices that have developed around the discourses of wellbeing. It was Michel Foucault’s belief (1988c: 39) that since the 1960’s a seeking of self-truth within individuals developed. From this change in emphasis in the subject, we have today arrived at the intersection of the rapidly-growing science of wellbeing and the informing of policy with research drawn from advocates of the positive psychology and science of wellbeing movements. The work of the psy-disciplines over last 3 decades and prior, is embodied within a current wellbeing agenda that is playing a contributory role in constructing us as governable subjects. The political analysis addressed here is not merely a ‘state-centred’ approach in which the wellbeing sciences act as a servant of power to governing bodies, but rather in how these forms of scientific knowledge actively shape and transform power. The target here is not scientific truth in itself but the claims to scientificity of the objects of wellbeing and happiness which take as natural something that they have in fact shaped, in ways and for reasons that are often largely exterior to the object itself. According to Foucault (1991: 11), the political economy of truth (here, the ’truth of wellbeing’) is characterised by 5 important traits, namely; it revolves around a scientific discourse and its institutions; it is subjected to continual economic and political incitement; it is the object of immense diffusion and consumption as it circulates the social body; it is produced and disseminated by a few dominant apparatuses (eg. academia, thinktanks, the media); and it is the centre of an ideological social and political debate. The discourses around wellbeing are now being played out in a number of social settings, in education, healthcare, the workplace, in the media, within the family. Its discoveries are all around us in forms of positive knowledge or truth expertise that have been essential to the rationalities of government. Analyses of governmental practices reveal particular rationalities of politics, of how governing is conducted in time and place, underpinning, as in the case of the National Wellbeing Project, the strategic texts which analyse ‘problems’ and unveil ‘solutions.’ A lattice of commonsense assumptions that then permeates the training and education of professionals or public, and filters through cultural forms, such as the self-help genre or advice columns. The complexity of wellbeing discourses makes them powerful to disentangle ourselves from and the possibility that a wellbeing index could provide a penetrative gaze that produces, classifies, normalises and corrects us, a form of disciplinary power operating through surveillance and observation, has to be of concern. There is a danger that the leading proponents of wellbeing science are prescribing the constituents of wellbeing to an absorbing, accepting public. There is insufficient guarding against a pre-created, falsifiable happiness framework. The New Economics Foundation, a non-governmental organisation with influence working within the ONS advisory panel, uses the findings of happiness research to forward the argument for a reform of policy objectives away from material accumulation toward the activities that they have found to be more closely aligned to wellbeing, such as civic and family life and meaningful work (for instance, nef champions the introduction of redistributive policies as a means to level inequality, and advocates the idea of a universal citizen’s income). Along with the dissemination of happiness research, there is a risk that the public are being shepherded by preconceived, pre-packaged objectives in the promotion of wellbeing as policy goal. This matters. The conclusions of the wellbeing agenda could easily find their way into political orthodoxy and the ‘quantification’ of a population. Within the ONS report National statistician Jil Matheson said the measures of wellbeing would need to be “reliable and impartial and serve to improve our understanding of the UK’s society” (ONS, 2010: line 27, p2). This spring, the Economic and Social Research Council (ESRC) is holding a conference to follow the public consultation process, the danger is that the agreed official definition of wellbeing will be unreliable and partial, decontextualised and value-laden and will provide a measure that cannot be considered objective or scientific. Ahmed, S. The Promise of Happiness (Duke University Press, 2010). BBC (2010) Plan To Measure Happiness ‘Not Woolly’ – Cameron.‘ http://www.bbc.co.uk/news/uk-11833241. Christopher, J.C. & Hickinbottom, S. (2008) Positive Psychology, Ethnocentrism, and the Disguised Ideology of Individualism Theory & Psychology, Vol 18: 563. Cromby (2010) The Greatest Gift? Happiness, Governance & Psychology Social & Personality Psychology Compass 5, 11, 840-852. Easterlin, R. (1974) Does Economic Growth Improve The Human Lot? Some Empirical Evidence, Nations and Households in Economic Growth: Essays in Honour of Moses Abramovitz, pp. 98–125 (New York: Academic Press). Foucault, M. ‘Critical Theory/Intellectual Theory‘ interview with Gerard Raulet, in L. Kritzman (ed.) Michel Foucault: Politics, Philosophy, Culture: Interviews and other writings 1977-84 (London, Routledge, 1988c). Layard, R. Wellbeing Conference, HM Treasury, 25 November 2010.http://cep.lse.ac.uk/textonly/_new/staff/layard/pdf/Layard25_11_10.pdf. nef (2011) The Practical Politics of Wellbeing. Source: http://www.neweconomics.org/publications/the-practical-politics-of-well-being. ONS (2011) Measuring National Wellbeing: The Findings. Rabinow, P. (ed.) ‘Truth & Power’ in The Foucault Reader, pp.11, (Penguin, 1991). Rorty, R (1993) Religion in the Public Sphere: A Reconsideration of Religious Ethics, 91, pp.141-149. Rose, N. Governing The Soul (London: Routledge, 1989). Seligman, M. & Csikszentmihalyi, M. Positive Psychology: An Introduction, American Psychologist 55, 1, (2000). Wetherell, M., Taylor, S. & Yates, S. Discourse Theory and Practice: A Reader, (The Open University, 2001). Wetherell, M., Taylor, S. & Yates, S. Discourse as Data: A Guide For Analysis (The Open University, 2001). Willig, C. Introducing Qualitative Research in Psychology, (McGraw-Hill, 2008). Wilkinson, W. (2007) In Pursuit of Happiness: Is It Reliable? What Does It Imply For Policy? Policy Analysis, Cato Institute. Yen, J. (2010) Authorizing Happiness: Rhetorical Demarcation of Science and Society in Historiocal Narratives of Positive Psychology Journal of Theoretical and Philosophical Psychology, Vol 30, No 2, 67-68.